Pilsner Urquell’s beer in the U.S. wreaks of diacetyl (butter aroma and flavor) so I don’t drink it. But here in Europe it tastes much better. I don’t understand why, they claim the beer is the same and it’s pasteurized so the diacetyl is not coming from an infection in the bottles. My guess is that it’s so much more fresh here that the malt and hops mask the diacetyl while the older, less fresh and poorly-handled beer that is shipped to the U.S. loses the malt and hops aroma so it doesn’t mask the butter aroma as much. Since Pilsen (Plzen) is the birthplace of Pilsner beer I wanted to come here while traveling nearby. And because Pilsner Urquell invented the Pilsner beer style and because I’d seen pictures of it in Michael Jackson’s Beer Hunter TV shows, I wanted to visit the brewery. It’s definitely worth the $10 or so for the ticket! The Czechs wanted to make a pale lager, pale like the wheat ales that were popular in Germany at the time, as lagers then were darker. They hired Josef Groll as the first brewmaster and he is the one that invented Pilsner beer: lightly malted barley from Pilsen, Czech Saaz hops, soft Pilsen water and yeast he took from some German brewery. It was only 5 years earlier that a German physiologist, Theodor Schwann, discovered that yeast is a living organism and is what causes fermentation. The hydrometer was invented the following year by a Czech chemist, Karl Balling. The same year Pilsner Urquell started, Emil Hanssen was born, who discovered decades later that there were many strains of yeast, including that ale and lager yeasts behaves differently. At least one reason Pilsen was chosen was because it was on top of easy-to-excavate sandstone and they knew they’d be digging underground to make caves to store (“lager”) the beer. Gay and I opened the Optimism booth at the Brewers Festival this morning. Once again, we missed the awards ceremony but were happy to learn that we won 3 silver medals for Ale X, Pride and Raspberry Solarpunk. It’s a fun festival to pour at, I like Marymoor Park. 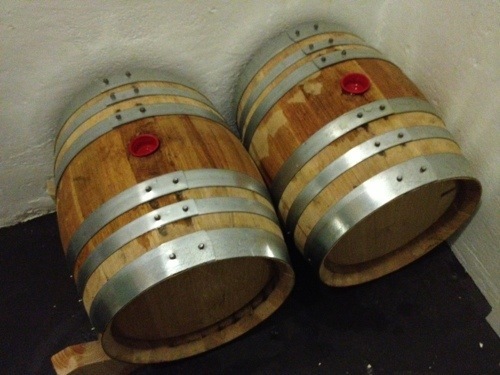 And the Bourbon Barrel-Aged …Before the Dawn was super popular, bettering even the king B.E. Juicy which is our most popular beer. Jon and Megan came to the festival so once our shift was over so we got to try a bunch of beers from breweries we never make it to. I love pumpkin beers and Fall is coming fast so I’m brewing 10 gallons of a pumpkin ale. Last year I made Punkin’ Ale. This year it’s my own recipe, and looking at last year’s recipe now, mine is similar except I’m using Golden Promise malt as the base, just one charge of Magnum hops for bittering, and I’m adding molasses and using pumpkin in the boil instead of the mash. I plan to serve this on Halloween. Tastes fantastic right now. I’m brewing two batches in the same day for the first time today. Both batches are the same recipe, an Oktoberfest, a.k.a. Marzën, once with a decoction (there’s a brewing term not derived from German!?) and once without decoction to see if I can taste a difference. Some people believe decoctions are critical to making lagers and others believe the difference is slight and not worth the effort. As usual, the truth is probably somewhere in between. It’ll be interesting to see which side of the fence I land on. 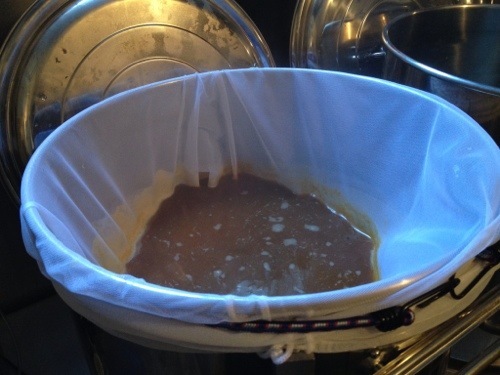 I filled the HLT and measured out the grain last night so I could get started right away this morning. I was awake at 5:20am, excited to get started, but tried to get some more sleep. By 6am I was out of bed and in the brewery heating the strike water by 6:20. I went upstairs for orange juice and to make coffee and still nobody else in the house was awake. I went back down to the brewery to mill the grain. When I came back up for a cup of coffee, Gay and the kids were having breakfast and Gay had made me eggs and bacon. I had a nice leisurely breakfast. By then, the water was heated. I doughed-in and my long brew day was underway. 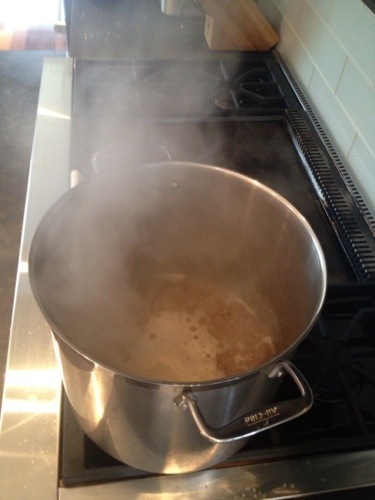 Everything went smoothly, including boiling the decoction mash that I did without scorching it. I finished and cleaned up by 6pm, more than 11 hours. I still have to pitch the yeast and aerate it tonight after it chills in the fridge from 22°C to lager temperature at 10°C. It was fun, but I’m tired and my feet hurt. 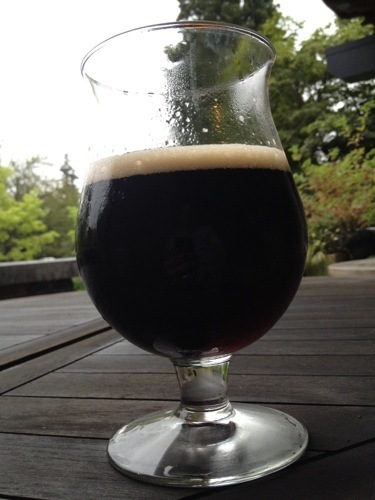 It’s a cloudy/rainy dark lager weather day so I’m having a tasty Dunkel outside and relaxing now. In a month or two I should know if the decoction made a difference in the flavor. Looking forward to the Fall when the leaves turn the color of an Oktoberfest beer! 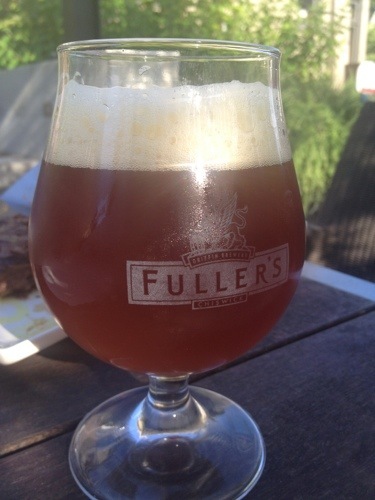 I have finally cloned Fuller’s ESB, my favorite beer! English crystal malt, Simpsons Dark Crystal specifically, is the key. It’s July 4th and I’m free from my dependence on beer from England. I’ve brewed 12 times on the new brewery now. I’ve been tweaking the setup over the batches and ended up switching from a plate chiller to a counterflow chiller rather than fight the losing battle of trying to filter pellet hops, I added a valve to the boil kettle so I can recirculate the wort while it’s chilling to do whirlpooling before transferring it to the fermenter, added a quick connect to the hose in the mash tun to make it easier to remove for cleaning, shortened the hoses as much as I could and put 90º elbows on some valves to prevent hoses from kinking (and to make it more ergonomic to connect and disconnect them). The process and cleanup is becoming smoother for me. 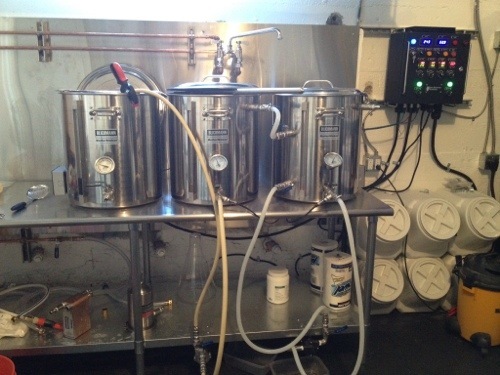 I finally got to brew on my new brewery setup today. 4 months ago I decided I didn’t want to brew outside anymore, I didn’t want to haul all the equipment outside and back inside, I didn’t want to stand around in the cold and rain and, most of all, I was convinced I’d never be able to brew the same beer twice with the equipment I had. Moving everything into the basement was a great option except I didn’t feel comfortable using two 70,000+ BTU burners inside the house for 4 hours and worrying that the carbon monoxide would kill the wife and kids or, worse, me! To compare, a high-end residential kitchen stove gas burner is 25,000 BTUs, “normal” stove burners are more like 15,000. 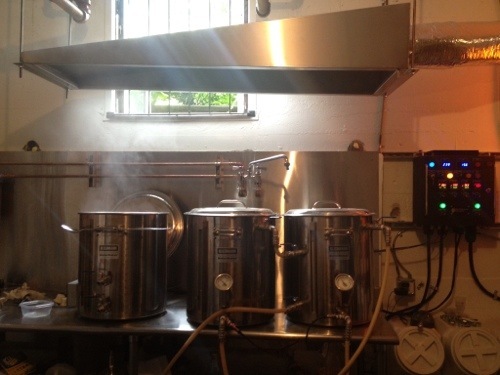 I also wanted to brew more than 5 gallons at a time, which was about the maximum for my equipment. Time to upgrade! The home brewery is finally finished. Or, finished for the time being as I’ve already figured out that I will be changing and improving things as I find what doesn’t work well. After the last update, I installed the backsplash. I cut 4 inches off one of the table legs so that it could fit against the wall. It took me 3 days to install the ventilation duct and inline fan to vent the heat and steam outside the house. That was the hardest part of the job, I built it all twice! I tend to follow the carpenter rule “measure once, cut twice”. I mounted an electrical box with a fan control and switch to control the speed of the vent fan to keep it quieter when I don’t need it to be 100% power, which is loud. Then I punched a bunch of holes in the kettles to install valves, a temperature probe and a coil of stainless steel tubing in one that acts as a heat exchanger. I mounted the pumps underneath the bottom shelf of the table. I drilled a bunch more holes in the wall to mount hangers to secure all the electrical cords. After assembling all the pipe fittings and testing for leaks and making some hoses, I was done by Thursday, Valentine’s Day. I had wanted to be done by Tuesday and to brew a Chocolate Cherry Porter on Valentine’s Day, but I missed it by 2 days. Oh well. I ran through a trial brew day with just water to get used to controlling the system and was ready to brew my first batch on Saturday. The plumber removed the old 3-compartment cast iron sink and plumbed in the new sink yesterday. He still has to come back on Monday to run some more plumbing that I need. The ventilation hood is built and was delivered this morning along with a 4’x9′ sheet of stainless steel that I’ll use as a backsplash. I installed lengths of unistrut on the ceiling and hung threaded rod, which suspends the ventilation hood. I was reminded of how hard it is to drill in the old-growth 100 year-old wood joists in this house! The control panel I ordered from The Electric Brewery in November finally arrived today. My favorite builder, Schuchart/Dow, let me borrow their hammer drill so I could drill some holes in the concrete wall. 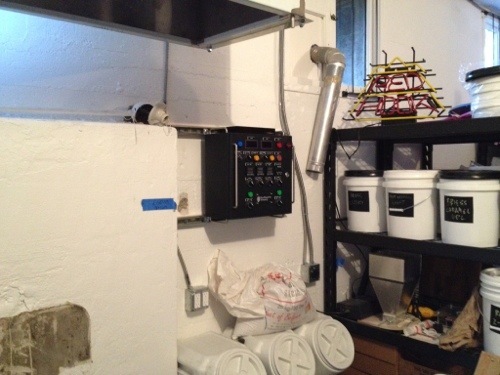 I mounted unistrut on the wall and mounted the control panel to that. I still need to install the backsplash, install the ductwork for the ventilation hood, modify the kettles and install the electric heating elements and plumbing in the kettles and do some other minor work. I hope to get all that done this weekend and then after the plumber finishes the plumbing, I’ll be ready to brew!